CLICK HERE FOR MORE STORIES BY K.D. EDWARDS. 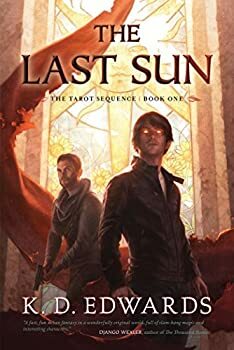 There is plenty to like in The Last Sun (2018), K.D. Edwards’ inaugural novel of THE TAROT SEQUENCE series. The story is set in New Atlantis, a city and an island in our world, but inhabited by the survivors of the original Atlantis. After a world-war with humans for reasons not given, the surviving Atlanteans settled in this spot. They interact with humans, but most of the action in this book takes place between feuding Atlantean family groups who name their clans or Houses after the Major Arcana of the Tarot.